Reading posts about EMG/Expert machines, I found a thread about the tonearm counterweight devices. Here I bring some photos of a very simple one I made, using old gramophone parts (motor flying weights, a speed control lever) and a bit of wire and felt, attached to the tonearm by means of a screw pipe clamp. It works fairly well, although it has not the swinging feature, and if you want to turn upside down the goose neck, you have to turn the counterweight lever horizontally at the same time with the other hand. It started life with two twin weights, but in the end I found it better to eliminate one of them, leaving a single one at the most extended position. It reduces notably the drag of the needle, and one can play more records in one single winding. This is the first real advantage I've found. The bamboo lasts longer, perhaps, although it depends strongly on the point. I usually make my own bamboo needles, and the good ones work as well without the counterweight. With the good ones I can play several sides without repointing. Of course the record modulation is a determinant factor, as also is the kind of surface. I'm not yet able to define the effect of the counterweight when using bamboo, although overall it seems to ease the needle travel across difficult records. I've also noticed the important role of the soundbox weight in polishing the point against the grooves, and the counterweight acts against that. As a preliminary conclusion on the advantages of the counterweight when using bamboo I can only point out the lesser record drag and the easier needle travel on difficult records. The steel needles also seem to collect less record dust at the end, but only in difficult records. I always use soft steel needles (purchased by the thousands from Mike Child and Barry Williamson many years ago). I mean that on easy records the effect of counterweight is not noticeable. With the 5B soundbox I use, on easy records there is no black dust at the end of a side. The record drag is lesser with steel than bamboo, of course, but this is only noticeable with worn or difficult records. Again, the most immediate effect of the counterweight is simply this one. The motor has an easier life and a winding plays more sides with the counterweight. Anyway, still I'm experimenting and learning about it. I show it herein as a curiosity, if you want... but it works as well as any commercial device. Still I must improve it to be able to turn up the soundbox with ease. There are other physical, deeply theoretical advantages, improving the soundbox output because of the mere increase of the overall reactive mass of soundbox plus tonearm against the needle vibration, which improves the efficiency of the soundbox in conveying the vibrations to the diaphragm. EDIT 2019-02-26: This is not true, given that the counterweight adds the mass to the tonearm after the rubber collar in the filtrer line. Some photos here. They are more or less self-explaining, but any questions or detail requests are welcome. File comment: Overall view. Resting position. File comment: Detail. 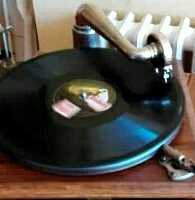 Pipe clamp fixed on tonearm crook. The speed lever is fixed bi simple pressure on the clamp screw head. File comment: Detail. Adjustable speed lever used as counterweight lever. File comment: Detail. A motor flyweight used as counterweight. A piece of wire is fixed to the weight screwhole and ringed around the speed lever "finger pin". Last edited by Inigo on Tue Feb 26, 2019 6:29 pm, edited 2 times in total. It is a creative design! how do you manage to swivel the gooseneck without scraping the turntable? do you have to remove the counterweight arm? Got it. Clever design. I made counterweights using coil springs and wire, attached to the base of the arm and to the soundbox back. Not very nice to look at, but they work well, and as you mentioned, serve to extend the life of the thorn needles I utilize. One of my machines came with an adjustable counterweight installed, which also works well. Do you notice any change in sound quality or volume? Other than possibly reducing record wear, do you see any advantages? In my case, the only advantage is reduction in the wear. I practically only utilize thorn needles, and the counterweights allow me to have a full play of a 12 inch 1940's heavily modulated record with no distortion until the end. Without it, the thorn starts to give up and distort at about ⅔ of the play. However, the counterweight should not remove too much of the soundbox weight, as it will create mistracking and increase the background noise. I haven't noticed any change in sound. And except for the reduced needle drag on the record, still I cannot notice any other succulent advantage. The hmv194 which I'm currently using almost on a daily basis to play 78s has four springs, and when running it normally, I cannot play more than four 12" sides. With the counterweight, the drag is less and the motor still can play one or two more sides. Last bumped by Inigo on Thu Feb 28, 2019 4:42 am.